Setting the record straight on fire sprinklers. In this article, we will look at various myths and misinformation that is related to fire sprinklers. A lot of the misinformation comes from television and movies. Where we see sprinklers, all going off in unison, this along with other popular media has given many people an incorrect understanding of how exactly sprinkler systems actually work. 1) Do sprinklers discharge during alarm activation? 2) Do sprinklers only spray water? 3) Do all the sprinklers go off at once? 4) Are sprinklers more damaging than the fire? 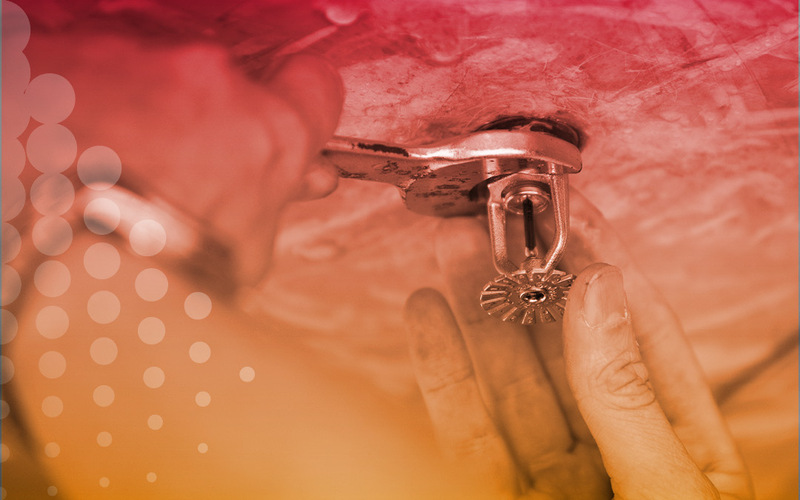 5) Does a compliant building benefit from a sprinkler system? 7) Do sprinklers activate incorrectly? 8) Will the pipes burst in the winter? 9) Do smoke alarms keep the building fire safe? 10) Is testing on an undischarged sprinkler system necessary? 11) How do I install fire sprinklers? False. The majority of all fire sprinkler systems do not discharge due to an alarm. Sprinklers use thermal elements that melt when heated. When this element melts away the system becomes active. This then discharges the water from the tank to the sprinkler heads whose heating elements has triggered. An alarm is not an automatic trigger, not many fire sprinkler systems are designed to discharge all sprinkler heads in the event of an alarm. 2) Sprinklers only spray water? False. 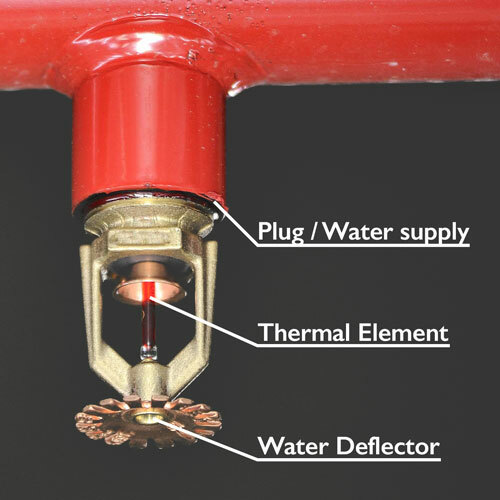 While it is true the majority of fire sprinkler systems installed discharge water in the event of a fire, it largely depends on the environment a sprinkler system is going to be installed to, in office space, retail environment or residential buildings typically use wet pipe systems that contain water, whilst others do not. A sprinkler system installed to a kitchen would be using wet chemicals agent. Water would make the fire worse, kitchen fire require the saponification process, which will suffocate the fire. False, sprinkler heads have individual heating elements/triggers so it has to be close enough to the fire for it to go off. Only deluge systems activate all sprinklers at once, deluge systems are only installed in specific high-risk scenarios such as fuel/oil storage. False, when the appropriate system is installed by a professional fire suppression expert. The system provided will be appropriate for the environment and will be designed to suppress the fire quickly and minimizing the damage done by a discharge. In England, in 2016-17 the average response time of a fire department was roughly 8 minutes and 44 seconds. In which time a fire can spread significantly, this is why it is imperative that an appropriate system is in place that can instantly start fighting and suppressing fire. Just because your building is designed in a way that passes fire regulations, doesn’t mean it is fireproof. Rather, it’s designed in such a way that occupants can get out safely before a fire grows out of control. A sprinkler system will help to address property loss by putting a fire out quickly and efficiently. Unlikely, but not impossible. Due to factors such as irrigation and usage experienced by the system, your plumbing at home will be much more likely to develop a problem e.g. leaking, pipe-corrosion. Highly unlikely. This is due to the way in which the sprinkler becomes active. Because the heating element must reach a certain temperature before a discharge occurs. Meaning that smoke (without heat) couldn’t set off a sprinkler system. Somewhat. All buildings should have sufficient smoke alarms in every room. It is important to remember that smoke alarms can only alert you that there is a problem. The alarms cannot stop the fire from spreading. Additionally, many smoke alarms are battery powered and which means that the alarm will not sound in the event of a fire if the batteries are drained. To keep your smoke alarm in good working order. Devon & Somerset Fire & Rescue Service recommends that you test a smoke alarm once a month. Change the battery once a year. Replace the whole unit every ten years. As well as cleaning your smoke alarm once every three months using the soft brush of your vacuum cleaner. This will ensure you remove any excess dust or insects. To read more visit their website. All aspects of any fire suppression system must be in 100% working order at all times, this enables the systems to be in proper working order if it is to do the job of fire suppression. The only way to know it is 100% operational is through frequent inspections carried out by experts. We would recommend dry testing every 3-4 months. Installing fire sprinklers isn’t a DIY job. In order to ensure the safety of your home or company, Certified sprinkler contractors can work with you to form a plan for where you want the sprinklers and how to get water to those various points. As well as maximising sprinkler coverage of any higher risk areas. Part of the planning process involves arranging to install the sprinklers with the least amount of disruption to the existing structure.